Edison plans to buy power from two solar farms to be built by First Solar in Southern California. Southern California Edison said Tuesday it has signed deals to buy power from First Solar, which plans to build two solar power farms totaling 550 megawatts under the proposed contracts. Tempe, Ariz.-based First Solar would erect a 250-megawatt power plant called Desert Sunlight in Riverside County, near the city of Desert Center. The second, 300-megawatt power plant called Stateline would rise out of northeastern San Bernardino County. Both power plants would be located on public land managed by the federal Bureau of Land Management, said Alan Bernheimer, a spokesman for First Solar. Edison plans to buy power provided by the two solar farms rather than owning and operating them on its own, said Vanessa McGrady, a spokeswoman for Edison. The power purchase agreements will need the approval of the California Public Utilities Commission. The projects are the latest in a series of deals signed by Edison this year alone to buy solar electricity from large, centralized power plants. Edison has to follow a state mandate that requires all investor-owned utilities to get 20 percent of their electricity from renewable sources by 2010. The utility said 16 percent of the power it delivered in 2008 came from renewable sources, and most of that came from geothermal and wind. The state Legislature is considering expanding that requirement to 33 percent by 2020. In June, the utility said it would buy power from two projects totaling 484 megawatts from Solar Millennium. Edison has the option to buy power from a third, 242-megawatt project to be built by Solar Millennium. In February, Edison said it would buy power from 1.3 gigawatts of solar power plants, which will be built by BrightSource Energy. Both Oakland, Calif.-based BrightSource and Germany-based Solar Millennium use solar thermal technologies, which make use of mirrors to concentrate sunlight for generating heat and producing steam. The steam then drives generators for electricity production. First Solar's projects will use the company's own cadmium-telluride panels. The company began to pursue project development activities in earnest earlier this year when it purchased the unfinished projects from OptiSolar. One of the projects involves building a 550-megawatt solar farm in California's San Luis Obispo County and sell the electricity to the Pacific Gas and Electric in Northern California. First Solar plans to start building the project on private land in 2010. OptiSolar, based in Hayward, Calif., had trouble raising enough money to continue developing the projects while also manufacturing its own solar panels. First Solar, whose largest market is Germany, is using these projects to drive demand for its solar panels in North America. It already has built a 10-megawatt project in Nevada for Sempra Generation, which is selling the electricity from that project to PG&E. Sempra also has hired First Solar to build another, 48-megawatt power plant next to the 10-megawatt project. For its deals with Edison, First Solar would build the solar power plants and then sell most or all of its equity stakes in them to investors or power producers by the time it completes the projects, Bernheimer said. Edison and First Solar declined to disclose the costs of construction or values of the power purchase agreements. Construction for the Desert Light project is scheduled o begin in 2012 while the Stateline project would start in 2013. 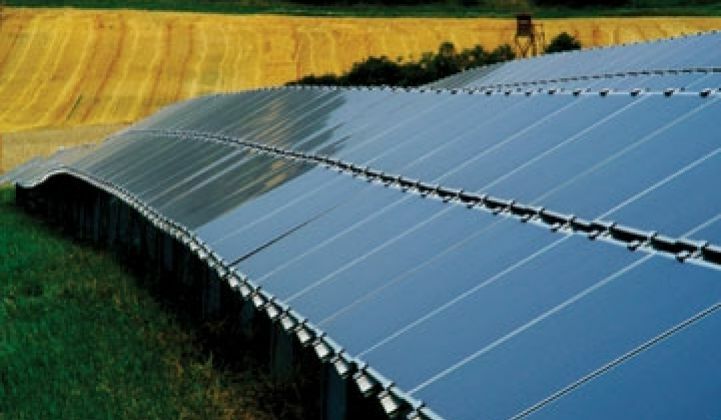 First Solar expects to complete both in 2015. The two solar farms would produce a total of 1.2 billion kilowatt hour of electricity per year.